Foto: SOBIRIN, 2005, Jatigede Reservoir Area, So Sad……! According to S. Sobirin of DPKLTS, the whole river system in this area is in a bad condition. The Cimanuk river, which would be dammed at Jatigede, is itself a 'sick' river, according to Sobirin, and needs restoring, before anything else. It looks as if more than Rp 6 billion (around USD 700,000) has been embezzled from funds meant for compensation and public facilities for displaced villagers, according to research by the Bandung Legal Aid Institute (LBH Bandung). In February, LBH Bandung publicly announced its suspicions that the huge sum had been misused, throwing government officials involved in project onto the defensive. The findings come from a 2003 study into land acquisition at the Jatigede dam project, in Sumedang district, West Java, which also documented human rights violations and environmental concerns. The dam, which has been planned since the 1960s, will affect around 6,000 hectares of farm and forest land, forcing around 28,000 people to move. The World Bank, which provided a loan to design the dam, does not think the dam merits further financial support. (see DTE 59 for background). In one village, Cisurat, for example, the researchers found that villagers received only 12-33% of the land value fixed by the Sumedang district head (Bupati). Overall, from 2000 - 2002, Rp58 million was paid out in compensation, but the sum should have been more than Rp 1 billion. LBH Bandung also found that money allocated for public facilities had not been spent as stated by the Department for Regional Infrastructure and Settlement. For example, the department stated that 105.8 ha in Cibuluh village was used for facilities costing Rp1.4 billion, but when they checked on the ground, this location was still being used by local people and nothing had been constructed. The West Java governor, Danny Setiawan, was reported to be 'visibly shocked' at LBH Bandung's findings, and said he would check whether the information was true. One former official denied there was any corruption at the project during his term as project leader, and the current co-ordinator of the dam project also denied any wrongdoing. But LBH Bandung points out that these officials are legally responsible for any corruption of funds destined for rights-holders. LBH Bandung has formed an ad hoc coalition with other NGOs to support the Jatigede community organisation, FKRJ, in bringing the case before Indonesia's Anti-Corruption Commission. The coalition is also pushing for the dam project's environmental impact assessment, completed by Padjajaran University in 1986, to be cancelled because it did not take account of a geological fault in the area and failed to address the social impacts. The provincial and central governments are pushing for the project to proceed, saying it is the only answer to severe flooding and drought problems along the northern coast of the province. Indramayu district experienced bad flooding in February, leaving three people dead and 23,000 hectares of rice-fields submerged. The area was seriously hit by the long dry season in 2002. But opponents of the dam say the social and environmental costs of building the Jatigede dam are too high. According to S. Sobirin, of the Sunda Forestry and Environment Expert Board (Dewan Pakar Pemerhati Kehutanan dan Lingkungan Tatar Sunda) in Bandung, the whole river system in this area is in a bad condition, with narrow river channels and riverbeds silted up. If 'revitalised', the rivers flowing to the coast would be better able to cope with flood waters. The Cimanuk river, which would be dammed at Jatigede, is itself a 'sick' river, according to Sobirin, and needs restoring, before anything else. Local people represented by FKRJ are angry that their concerns are being ignored, while government officials continue to make pronouncements about a dam being the only solution to the flooding. Estimates of the loss of income to the local economy that the dam will cause range up to Rp 5 trillion (around USD 578 million) per year, from rice, tobacco, groundnuts, forest products and other crops. Around 1,200 ha is controlled by state forestry company Perhutani, which has agreed to release the land, if replacement forest land is provided. 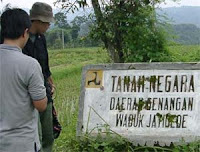 Local people are also arguing that the area contains a number of important historical or archaeological sites, including graves where the founders of the city of Sumedang are buried.